One of the most common type among them is osteosarcoma. Males between the age of 10 25 years are more prone to get affected by this. Osteosarcoma can be aggressive in rare cases. In such cases, it may also spread to the lungs. One of the most aggressive kind of bone tumours is Ewing's sarcoma. It commonly affects the children and adults. It does not affect people above the age of 30. most of the time, it occurs in the long bones of arms and leg. The second most common bone tumour is Chondrosacroma. They begin to develop in the cartilage cells. These kinds of bone tumours are most commonly seen among individuals over 40 years old. 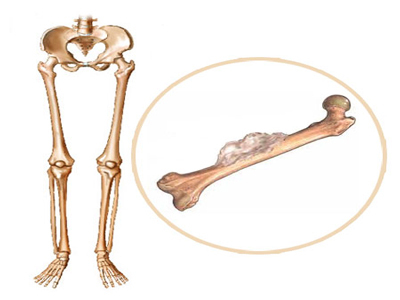 Bones of the pelvis and hips are mostly affected by chondrosarcoma. One of the rare kind of bone tumour is Fibrosarcoma. It affects people of 35-55 years old. Soft tissue of the leg behind the knee usually get affected by fibrosrcoma. Another rare kind of bone tumour is Chordoma. Adults above the age of 30 years are prone to get affected by this. Either the upper or the end of the spinal column get affected by it. Malignant fibrous histiocytoma (MFH) is the most prevalent malignancy seen during later adult life. 50-60 years old individuals usually get affected by this. The main and most common symptom of bone cancer is pain. The mild symptoms in the first stage will get severe with the improvement of the condition. Fever, chills, sweats, and weight loss can be very rarely seen among the affected people. Symptoms get severe with the severity of the tumour. The first and main method of diagnosis is the physical examination. The doctor will check for the symptoms and visible signs of bone tumour in you. If the first step is confirmed, then the doctor will suggest you medical examinations and tests like X-rays, CT s and MRI scans. Tests are done to get a detailed information about the tumour and also to make it confirm whether you have a bone tumour or not. The doctor may also suggest for other tests such as blood tests, urine tests, needle biopsy, open biopsy etc. to put together a list of possible causes.